Otherwise known as telangiectasias, spider veins are tiny, superficial veins that are often red or blue and appear as arborizing webs or isolated threads on the surface of the skin. They can occur on all areas of the legs and face. They are more commonly seen in women. 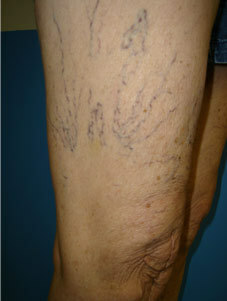 It is estimated that at least one third of the adult female population is troubled with spider veins. Spider veins are often but not always caused by chronic venous insufficiency, a situation whereby blood flows abnormally downward in the veins of the leg because of faulty valves or enlargement of the deeper veins of the legs . However, spider veins can also be caused by hereditary factors, hormonal changes, and increasing age. They pose no medical threat but can occaisionally be associated with symptoms such as burning. itching, or aching pain. 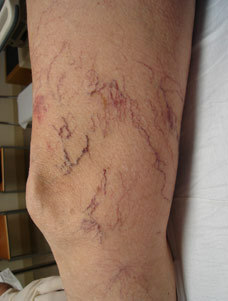 They often coexist with larger varicose veins. Microsclerotherapy and Ohmic Thermolysis (VeinGogh), both offered at Middletown Vein and Aesthetic Center is the best and most effective treatment for spider veins.